Work in progress abstract portrait, oil on panel. 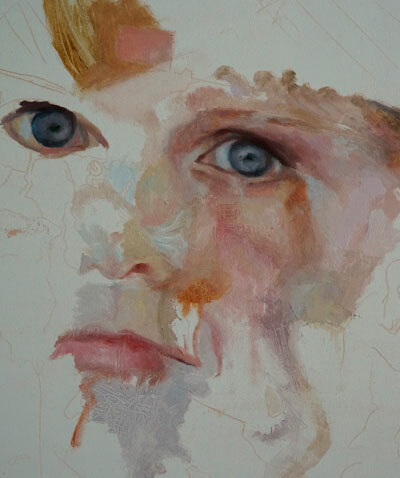 My current work in progress is this abstract oil portrait of a boy, as yet, untitled. I have lots of work currently on rotation in my studio at the moment. My Easel is starting to get a bit unhappy with the constant movement. Sometimes, for ease, I just secure a rectangle of hardboard and then clamp my artwork to that, however, this means somewhere on the painting has to remain dry at all times which is not always possible. I have lots of white shelving around my walls where I can place work in between painting sessions. Most paintings face me so I can examine and deliberate over them, but occasionally when I’ve stopped being able to read my work I turn them away from me. Often using a mirror to see your painting is another way to trick your brain to observe it with fresh, inquisitive eyes. It’s actually surprising how quickly we become accustomed to shapes and marks and stop being able to see them objectively. I’ve really started to enjoy and feel very natural making my abstract marks on the panel. Some get covered up with subsequent layers. 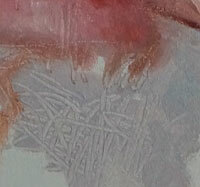 Although I often fall in love with these marks, I only retain those that I feel inform the piece. Sometimes it tough to be that ruthless but ultimately I want to make something that is cohesive, so the end goal and vision wins.